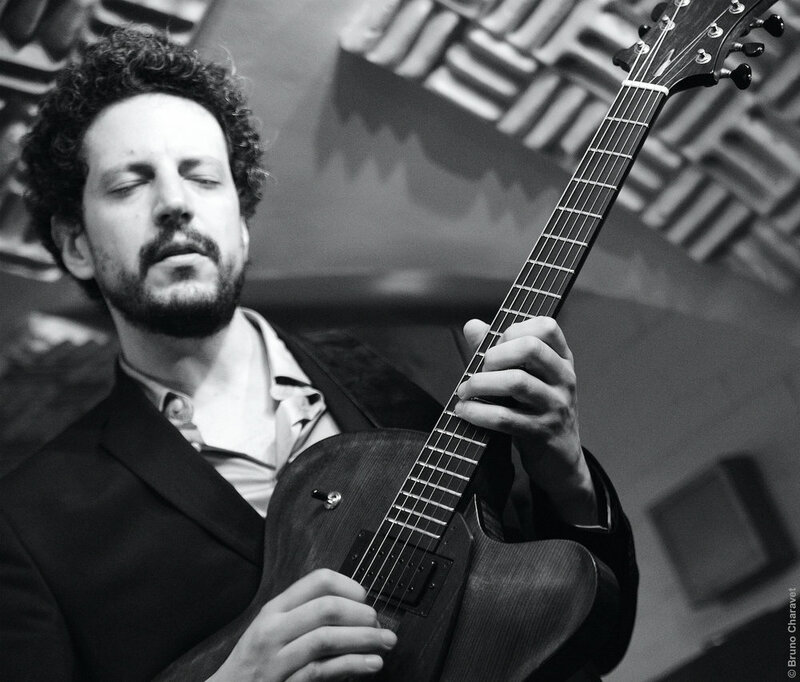 Born and raised in the south of Israel, jazz guitarist and composer Yuval Amihai started playing professionally at the age of 16. By 20, he was leading several jazz bands, performing in venues throughout the country and collaborating with his native city of Beer Sheva’s string quartet for a series of chamber music concerts featuring his compositions. In 2005 Yuval moved to Paris, France and quickly made his way into the city’s jazz scene. After attending the Paris Conservatory for two years, he formed his quintet, the Yuval Amihai Ensemble. The band won multiple awards including the 1st Prize at the 2009 La Defense National Jazz Competition (Grand Prix), where Yuval had also won the 1st Prize in the composition category, 1st Prize in the Saint-Germain Jazz competition and the 3rd prize in Hoeilaart international jazz competition in Belgium. Yuval also won the City of Paris’ “young talent grant” for two consecutive years. During the following years he toured extensively with his quintet throughout France and Europe and recorded his first album as a leader, named after his band, YUVAL AMIHAI ENSEMBLE. Released in 2012, the album was acclaimed by critics and earned Yuval a full support from the French copyright organization SACEM grants program for self-produced albums. In 2015 Yuval formed his trio and released his 2nd album, LONGING. The album was warmly received by critics on numerous French and International media outlets. Following the release, the trio played on several live radio shows including French national radio FRANCE MUSIQUE and TSF JAZZ and continued performing regularly in Paris’ jazz clubs and throughout France. “Revelation” by Jazz Magazine and received positive reviews in many more music magazines, radio stations and cultural organizations, including France’s Jazz Academy (L’Académie du Jazz). That same year Yuval moved to New York City, where he resides and works today.